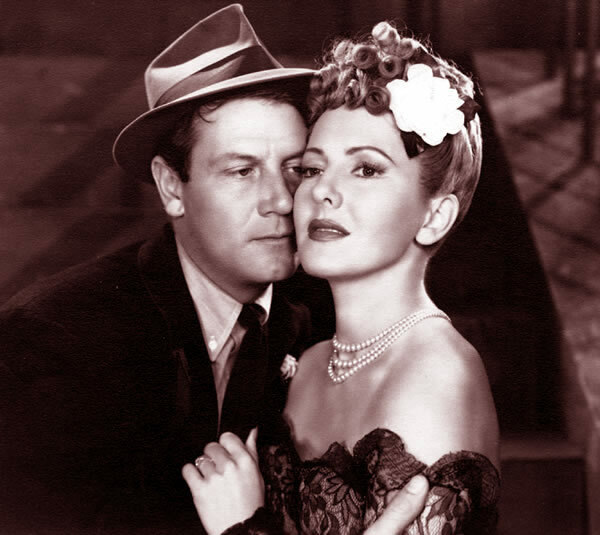 Jean Arthur and Joel McCrea in The More the Merrier. The delightful actress Jean Arthur is Turner Classic Movies' star of the evening tonight. Beginning at 5 p.m. PT, TCM will show five Jean Arthur movies: The Talk of the Town (1942), History Is Made at Night (1937), The Public Menace (1935), The More the Merrier (1943), and Mr. Deeds Goes to Town (1936). Directed by George Stevens, The Talk of the Town received seven Academy Award nominations, including Best Picture and two for its story and screenplay. (Back in those days there were three Best Writing categories.) Arthur is outstanding as a schoolteacher – this is perhaps my favorite among her performances – torn between a law professor (an equally outstanding Ronald Colman) and an escaped convict (Cary Grant). As a plus, former Warner Bros. contract player Glenda Farrell is excellent in a supporting role. The Talk of the Town is not to be missed. Though much less famous than Stevens' prestigious dramas A Place in the Sun, Shane, and Giant, this 1942 socially conscious comedy is just as good as those other titles – if not better. I've never watched The Public Menace. Will rectify that matter shortly, though the presence of George Murphy doesn't make this minor Columbia entry seem very enticing. Now, I've watched Mr. Deeds Goes to Town several times. Though I'm no fan of Frank Capra's mushiness, which I find, well, mushy (and dishonest), I do enjoy this one because of the chemistry between Arthur and leading man Gary Cooper, in addition to a whole array of solid supporting players, especially Douglas Dumbrille. Capra won a Best Director Oscar for Mr. Deeds. The fact that at the time he was the president of the Academy of Motion Picture Arts and Sciences surely didn't hurt his chances of taking home his second statuette. The first was for It Happened One Night, released two years earlier. The third would come two years later, for You Can't Take It with You. 5:00 PM THE TALK OF THE TOWN (1942). An escaped political prisoner and a stuffy law professor vie for the hand of a spirited schoolteacher. Dir. : George Stevens. Cast: Cary Grant, Jean Arthur, Ronald Colman, Glenda Farrell. Black and white. 117 min. 7:15 PM HISTORY IS MADE AT NIGHT (1937). A romantic headwaiter fights to save a woman from her possessive ex-husband. Dir. : Frank Borzage. Cast: Charles Boyer, Jean Arthur, Leo Carrillo, Colin Clive. Black and white. 97 min. 9:00 PM THE PUBLIC MENACE (1935). A cocky reporter's marriage to a manicurist jeopardizes his career. Dir. : Erle C. Kenton. Cast: Jean Arthur, George Murphy, Douglass Dumbrille. Black and white. 73 min. 10:30 PM THE MORE THE MERRIER (1943). The World War II housing shortage brings three people together for an unlikely romance. Dir. : George Stevens. Cast: Jean Arthur, Joel McCrea, Charles Coburn. Black and white. 104 min. 12:30 AM MR. DEEDS GOES TO TOWN (1936). When he inherits a fortune, a small-town poet has to deal with the corruption of city life. Dir. : Frank Capra. Cast: Gary Cooper, Jean Arthur, George Bancroft. Black and white. 116 min. 'It's a Wonderful Life' Sequel to Be Drowned by Copyright Angel?